Dekmiak: Will privatization save social security? In this article I explain two arguments that I have never seen on the media or in any other setting, but which seem to be very important to the debate about privatization of social security. I do not want to give a general picture with an overview of pros and cons leading to a clear verdict. I just want to present these two apparently neglected arguments as my contribution to the debate. Also, I assume that you have some basic knowledge about how social security works. If you do not – please read my previousarticle about this topic. I am going to explain the arguments in detail first and at the end I will present a "cocktail party version." Sit tight. Many people are concerned that social security is going bust due to excessive future expenditure and insufficient future revenues. This is indeed a legitimate concern. There will be problems if we continue business as usual, although the problems are not as serious as some people paint them. Nevertheless, the proponents of privatization use the prospect of bankruptcy as an argument in their favor. Current system, so called pay-as-you-go, depends on the contributions of current workers to fund pensions of current retirees. When contributions dry up and the number of workers per pensioner dwindles, the system is bound to collapse. On the other hand, in the private system, workers would accumulate savings in their own private accounts. Upon retirement, pensions would be drawn from these accounts. Shortage of money would not occur and demographic change would not pose any threat. Therefore, using private sector instead of public sector to handle pensions would not have led to the problems we are facing today in the first place, and should avert similar problems in future. This argument seems neat at the first glance. But it suffers from one serious flaw: it treats money as if its value does not change over time. In other words, this argument is a product money illusion. By definition, economists are interested in allocation of resources in the economy. "Who will produce what goods?" and "who will consume what goods?" are the core questions of economics. Economists are interested in money, because money is a tool to allocate resources. But money in itself does not matter. The salience of money is derived from its ability to be exchanged for actual goods and services. When money loses this function (for example because of hyperinflation), it becomes irrelevant. Your material wellbeing does not depend of how much money you have but how much actual goods you can buy. Analyzing problem in terms of money is easy and often useful but sometimes it blurs the underlying nature of the problem. So let us forget about money for a while and analyze the problem in terms of goods and services. There are two groups of people involved in the problem. Domestic workers create all goods and services that are available for sale in the economy (with the exception of imported goods, but I will neglect the international trade for clarity of reasoning). These goods are consumed by the workers, pensioners, and other groups (like children, unemployed, etc. – for simplicity, let us forget about them too). So how exactly are these goods allocated between workers and pensioners? In ancient times each person was creating goods mostly for their own consumption. But modern economy benefits from division of labor, where efficiency of production and quality of services are increased thanks to specialization. Currently, each worker generates some amount of particular goods or services. Then, workers can exchange and share the fruits of their labor with other people. However, workers cannot take the entire value of what they create for themselves. They have to give a share to the company owners in exchange for capital and internal services like HR or IT (this is done automatically so there is no conscious act of "giving"). They also have to give a share to the government in form of taxes. Finally, they have to give a share to the elderly through social security. To understand this process better, let us consider a very simplified version of the economy in which there are only eleven inhabitants of whom two are retired and nine are working. The economy is so simple, that the only goods are burgers. Each worker is able to create 1000 burgers per year. The people of this Burgerland decided to implement social security. There is a payroll tax of 10% which is paid to fund pensions. Payroll tax means that workers have to give 10% of the burgers they produce to the Social Security Administration (SSA). As a result, each worker consumes only 900 burgers per year. Because there are nine workers, SSA receives 900 burgers a year. This is split between the two pensioners of whom each receives 450 burgers. As a result, the retirement replacement ratio, that is the value of pensions in relation to salary received before the retirement is 450/900 = 1/2. Every worker can expect to receive upon retirement half of what they were earning while working. In other words, thanks the payroll tax, the resources of the economy are redistributed to the elderly in such a way so that they have half as much per person as the workers. Now, let us fast forward several decades. We observe that productivity increased thanks to technological progress. Every worker is now able to create 1500 burgers, an increase in productivity of 50%. We also see that a demographic change has occurred. Although there are still eleven people in the country, only eight are workers and three are retirees. The payroll tax has been kept at the same rate: 10%. Each worker contributes 150 burgers and consumes 1350 burgers. The total income of SSA is 8*150=1200 burgers and this is split equally among the three pensioners who receive 400 burgers each. You can see that the replacement ratio is 400/1350 which is less than 30%. Every worker expects to receive less than 30% of their salary upon retirement. Compare it to the 50% in the previous situation and you see a significant drop in benefits! This is similar to the situation which our real-life social security is bound to face in the future. There will be fewer people providing goods and services who pay payroll taxes and relatively more people buying these goods and services. As a result, the replacement ratio must fall or contributes must rise. These changes are imminent and will occur regardless of increases in productivity and changes to the country's GDP. How is privatization supposed to solve this problem? Let us give privatization the benefit of the doubt. Let us say that in the first period the nine workers were saving 10% of their income – that is they were consuming 900 burgers a year each. The two retirees had 50% replacement rate – they were eating 450 burgers a year each. Now, fast forward several decades and we observe that economic progress increased productivity to 1500 burgers per worker per year. Thanks to privatization we managed to somehow keep the contributions at 10% and the replacement rate at 50%. Everything is perfect... but wait a minute! There are eight workers, each consuming 1350 burgers a year. There are three retirees each consuming 675 burgers a year. So in total, there are 8*1350+3*675=12825 burgers consumed in this economy per year. But there are only 8*1500=12000 burgers produced in the economy per year! The numbers do not add up. In fact, there are not enough burgers for retirees to buy with the money they have. Something must have gone wrong! This is the key to the problem. The root of the issue is the demographic change. There will be relatively fewer people creating goods and services and more retirees consuming these goods and services. Fewer producers and more consumers mean that somebody has to lose. Workers must share more with retirees or retirees must consume relatively less. There is no way around it. Privatizing social security is similar to using creative accounting to solve financial difficulties of a company. It does not make the problem go away, it just hides it temporarily. Privatization blurs the picture and makes us unable to identify who is going to be hit the most by the demographic change, whether they will be hit abruptly or gradually and when they are going to be hit. Note that factors like inflation, economic growth, and so on, are here irrelevant. You may wonder how would a real life privatization scenario look like, as our Burgerland does not seem to be very realistic. If privatization was successful, we would have an increasing population of elderly with big savings account and a decreasing fraction of workers. They are areas of the country where elderly people tend to concentrate (e.g. Florida). In such places the number of people requesting services will increase and the number of people who can serve them will decrease most significantly. In order to compensate for the changes in demand for and supply of goods and services, prices will have to increase. The most affected will the de goods that the elderly buy. Let us consider health care. The increasing number of elderly will force hospitals to employ more doctors. Either doctors will have to be paid more to entice people who would otherwise choose other professions, or less qualified people will become doctors out of necessity. Most likely, we can expect a combination of both. This results in higher prices and lower quality of health care. On top of that, since more doctors means fewer people available to other professions, the prices of other goods will rise as well, although not as much. Such inflation can potentially wipe out savings of the elderly clustered in places like Florida. And their life will be in general tougher. Imagine a town full of elderly in which the last grocery store is closed due to a lack of work force. This may be a stretch but it illustrates the type of problems they would face thanks to demographic change. Privatization of social security is not going to change it. In a summary, the root of all evil is the demographic change. There will be relatively fewer people producing goods and more people consuming them. Somebody will have to lose. Thinking that privatizing social security will solve this problem is based on a mistake. Ensuring that money adds up is not enough. Value of money can change over time and what in the end needs to add up is not money but the amount of goods and services produced and consumed. The rate of return you receive from social security depends on your income. Social security was designed to reduce poverty among elderly. No wonder that people who made little money through their lives receive relatively higher pensions. For them, the rate of return is the highest and can reach above6 percent. For people making a lot of money, return on social security is negative – that is they pay more in payroll taxes than they receive in benefits. Although the richest people would potentially benefit the most from the privatization of social security, the argument goes that it would boost efficiency of the system as a whole. The average rate of return from social security is currently quite low in comparison to average returns from, say, US stock market. If the money from payroll taxes was invested in the stock market, retirees would be surely better off. Again, this argument makes sense at the first glance but falls apart after closer examination. The flaw here is the assumption that the same rate of return can be maintained for all these new savings created by the privatization. It is against the law of supply and demand. 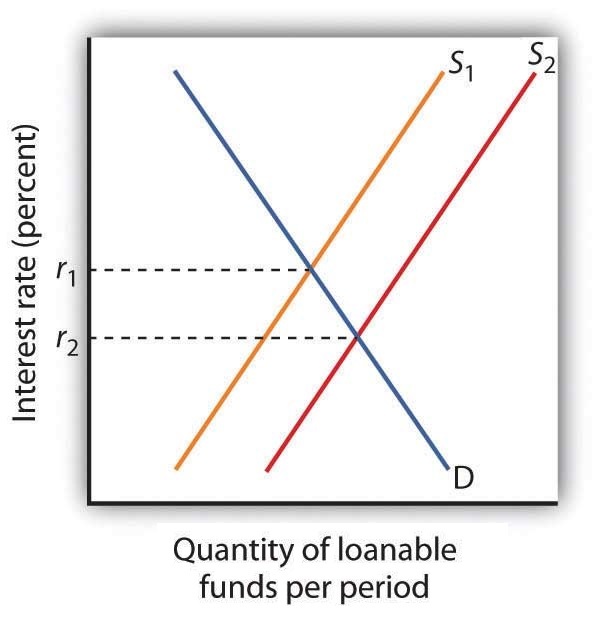 The more capital is there, the lower the interest rate. Notice that in practice the money held in private retirement accounts would be taken care of by pension fund managers. To make a return on the contributions, they would have to buy some financial assets, be it stocks, bonds, or other securities. The higher demand for the financial assets, the higher their price and the lower the returns per amount invested. Some people may think: yes, but availability of all these new capital will surely increase investment and thus lead to higher economic growth rates. That is to an extent true, but a clarification is needed. New enterprises and economic growth are not going to massively pop up out of nowhere just because new money for investment is available. New business ideas will probably continue to emerge at the same rate, just more of them will get funding. And guess what – financial markets tend to allocate capital to best, most promising, or safest investments. The new projects that would potentially get the additional money will be more risky and with lower expected profitability. In other words, increase in the amount of capital available will not magically increase the amount of capital needed. The shift of the capital supply curve to the right will not magically induce the shift of capital demand curve to the right. Rather, we will move along the demand for capital curve, towards the interest rate of zero. Of course, if the amount of new capital on financial markets is not too high, the change in the interest rate will be negligible. So what is the amount of savings that would be accumulated if social security was privatized? There are a few ways to estimate that amount. For simplicity, let us assume that people would contribute as much as they do today. We can then just take the total annual contributions to social security ($650 billion) and multiply it by the average number of years worked by a worker (40). As a result we get around $25 trillion dollars of savings that would be managed by the pension funds under privatized social security. This is more than capitalization of the entire US stock market. Such an amount will have a profound impact on rates of return. How sensitive is the market interest rate to an increase in the supply of capital? As often in economics, it is probably impossible to discern a general economic law in this regard. The answer will most likely depend on numerous circumstances like the source of the funds, the risk preferences of the fund managers, legal constraints, current market conditions (are investors bullish or bearish?) and so on. Recent experiments with quantitative easing can give us a clue. The objective of quantitative easing was to reduce long-term interest rates in order to spur economic activity. Central bank (Fed) buys very safe financial assets (e.g. government bonds), hoping that the investors who sold them would do something productive with their money, for example buy corporate bonds or make loans to companies. As recent research shows, there are many investors who have a preference for some class of financial assets. For example, some financial institutions are forced by law to put some fraction of their money in very safe assets like government bonds. They cannot simply substitute this investment with some more risky assets. As a result, quantitative easing has much weaker effect on the interest rate paid by debtors who contribute to economic growth (start-up companies, credit card owners, etc.) and a strong effect on interest rates of the assets that are actually purchased by the central bank (that is government bonds). The amount of money spent during quantitative easing is an order of magnitude smaller than the market capitalization of the bonds that were purchased through it. Yet it had a significant effect on their interest rates. And now, we are to believe that dumping a pile of cash greater than the entire US stock market capitalization onto financial markets is not going to depress rates of return. No, the correct assumption is that the privatization of social security will depress interest rates significantly. If proponents of social security privatization argue otherwise, they must explain why this is not going to happen. Let us summarize. Privatization of social security will generate a huge pile of savings. We know from experience that much smaller injections of capital into financial markets tend to depress interest rates. Assuming that the interest rate would be the same with and without privatization of social security is clearly nonsense. If you want to show off at a cocktail party, you will need a simplified and concise version of the arguments. I do not guarantee, that everybody is going to understand them. Actually, I guarantee, that somebody is not going to understand them. But you can always try. Disclaimer: I do not take responsibility for tears and bruises. Privatization of social security won’t save the underlying demographic problem. If you want to see why, imagine that no new people are born and eventually everybody in the country becomes retired. With privatized social security, it is very nice that everybody has their own accounts full of money. But there is nothing to spend this money on because everybody is retired and nobody is manufacturing goods and providing services! With social security as it is right now, the demographic problem can be clearly seen. With privatized social security we just do creative account to temporarily hide the problem. But we do not solve it! Comparing historical stock market rates of return to historical social security rates of return does not make sense. Privatized social security will significantly increase the stock of savings in the economy. And we know that more savings means lower interest rates from the simple law of demand and supply. As I mentioned, there are more economic arguments in this debate. In this article, I decided to focus on these two only.